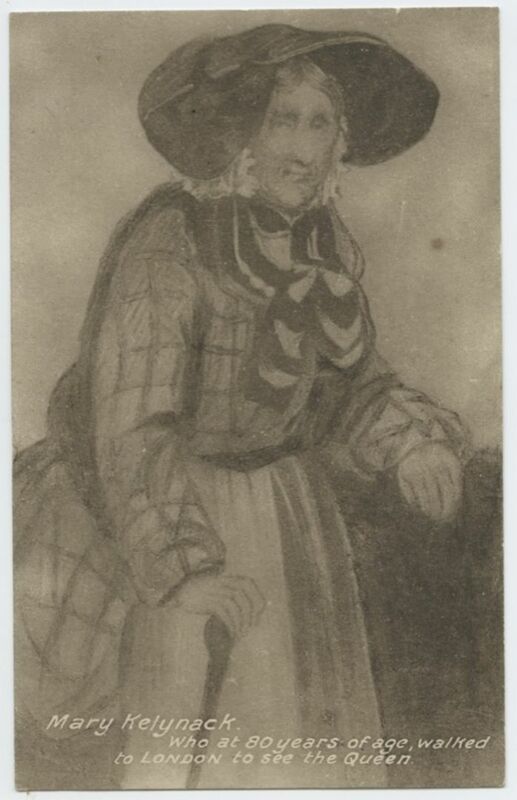 Many stories and tales have grown up around Mary Kelynack’s famous walk from Newlyn to London in 1851, including a local tradition that claims she took a turbot in her basket to present to Queen Victoria. As her walk took over five weeks this seems unlikely! However her visit is reported in a number of newspapers, including the Royal Cornwall Gazette of 24th October 1851. Taken together these reports give a detailed account of her expedition, the reason for her journey, where she went and who she met. Mary lived in Newlyn and in the 1841 census a Mary Kelynack (65) is recorded as living in the Fradgan with William Kelynack (70) receiving a pension. Ten years later it is likely that Mary was entitled to a small national pension which she had been trying to receive, to no avail, from the authorities in Newlyn so decided to walk to the Mansion House in London some 350 miles where she could put her case. The Royal Cornwall Gazette reports that the feat of Mary Kelynack and her possible visit to the Great Exhibition at the Crystal Palace did not pass unnoticed as a Mr Jago, a fellow Cornishman, told Prince Albert of her walk and ‘has been graciously pleased to transmit, through that gentleman’s hands a donation of 3l, in addition to the 2l presented by the Prince to Mrs Kelynack.’ She also came to the notice of an artist, Mr Burnard who was struck by her character and made a sculpture and a painting of her which was exhibited in Falmouth by the Royal Cornwall Polytechnic Society. Mary died on 28 November 1855, unusually her death was reported in the press, not just the local either. Mary's passing was reported by the Windsor and Eton Express, her long walk had made her a public figure but sadly, despite her exertions, she died poor and was buried in a pauper's grave.